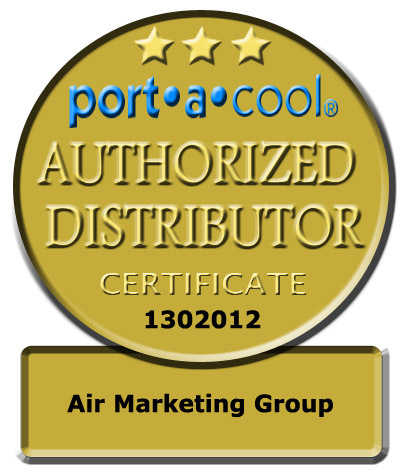 For almost 20 years, Port-A-Cool, LLC has been the industry leader in the design and manufacturing of portable evaporative air coolers and evaporative cooling media. We specialize in evaporative cooling: HVAC and Agriculture products, industrial and commercial products along with personal and residential products. Evaporative cooling uses tap water to cool air through evaporation and can cool up to 30 degree F. These devices are very efficient and economical and vary from typical air conditioners because they use vapor-compression. With a Port-A-Cool portable evaporative air cooler, you can achieve the cooling you need at much higher humidity levels than most other brands. A Port-A-Cool swamp cooler is the perfect choice for commercial or residential needs. For smaller models, see our Port-A-Cool KuulAire Evaporative Coolers. For smaller models, see our Port-A-Cool KuulAire Evaporative Coolers. Air Marketing Group is a Factory Authorized Distributor. When buying a Port-A-Cool product you should only buy from a Factory Authorized Distributor with the seal to left clearly marked on their website with a Serial Number.